Brewing is not just boiling up some grains, throwing in some hops and bottling. Brewing is a bit of science. It's a bit of practice. It's also a bit of experimentation. You can do all that right but sometimes it's still a bit of luck. Which is why when a brew batch goes wrong, it can sometimes be considered bad luck that your brew tastes like cabbage, butter or stinks of rotten eggs. But is it really bad luck that your beer tastes like wet cardboard? There are all kinds of chemical reactions happening in a brew and this is very normal and nothing to worry about. It could be that for many brewers the smell of the hops over powers these smells and so when they are finally smelled, they get flagged as a concern. For this brewer, I'd only be worried when it came time to bottle beer. And even then the first thing I would be asking is should I simply delay bottling another week? As every brewer knows, time is your friend when making beer! There are many elements that can shunt the beer train off it's brewing tracks, particularly improper preparation prior to making the beer and during fermentation and then bottling or kegging. Working out what went wrong and what it means means that you will be a better brewer for it. The best way to learn is by tasting your beer and understanding what the 'off flavors' of your beer are and how you might prevent them happening with your next brew. Here's a brief guide to help you trouble shoot common off flavours and what the smells mean for your beer! I've never eaten a rotten apple but I know what a sour green apple tastes like. In an apple, this is delicious. In a beer, this probably means you have a fair amount of acetaldehyde present. This chemicals forms at the beginning of the fermentation process. The yeast will eventually convert it to ethanol (alcohol). This is why it's good to let primary fermentation continue for a fair time and to let your beer condition for at least three weeks. The longer you condition your beer, the greater reduction in acetaldehyde that will occur and the beer your beer will take. It will also help to ensure that you correct a fair amount of yeast. If there is not enough yeast present in the beer, it will take longer for the acetaldehyde to be converted. If you beer has a cheesy taste, you're probably getting a sample of isolaveric acid. Often described as tasting like old socks, the acid occurs naturally all over the place, including, funnily enough, in the sweat of socks. In the case of beer brewing this acid develops when the alpha acids in hops oxide. The fix is too use fresh hops - both in leaf and pellet form and ensure they have been stored properly. If you do find it in your beer, once again, let the beer condition further and this will mellow it somewhat. Another way isolaveric acid can get into beer is when you are using fruit. If you get a 'Brettanomyces' infection from the skin, you'll run into trouble. Ever heard of skunked beer?This is when a chemical reaction happens in the bottled beer due to over exposure to direct sunlight. So named after the smell a skunk can release, 'lightstruck' beer is caused by the UV radiation in light from the sun and retailer's lights. The so-alpha acids in the beer (which come from hops) are broken down and form a new compound in the beer by joining with any proteins floating around. The solution is to condition and then store your beer out of sunlight or from under UV Light (why you would be doing that any way?). Brown glass bottles are can preventing this from occurring as they can mute the effects of the light but not so much green bottles or clear glass. I have no idea why this occurs. So, the trick to avoiding skunked smelling beer is clearly to store your beer in the dark. Funny how that's a solution to many of these flavoring issues eh? If your brew tastes a bit like cardboard or wet paper or simply feels stale, you've let in too much oxygen and your beer was over oxygenated. Here's the rule of thumb and oxygen when making beer. Before primary fermentation, it's encouraged. During fermentation and after it's discouraged. If this happens to you, you can't fix the beer. It is what it is. Drink it with some lime? The only way to prevent oxidized beer from occuring is preventing it from getting into your fermenter. Ensure the drum or carboy is tightly sealed and that your bubble airlock / airvent has water in it. When preparing the wort, oxygen is good because the yeast uses it before fermentation. When the yeast is doing its job, it doesn't need it. I once went to bottle a brew. The moment the beer came out out of the tap, a rank smell began to permeate throughout my man shed. It was disgusting, like some kind of vile stink bomb had been let off or I had dropped a case of rotten eggs on the floor. My brew was somehow contaminated. That rotten egg smell can most likely be identified as the gas hydrogen sulfide - which was the by-product of fermentation gone wrong. It is the by-product of the yeast strain or bacteria that have snuck into your brew (did we ever mention you've got to sanitize your equipment?). The thing about lagers and rotten smells is that all is not necessarily lost. You can fix this problem if the sulfide was produced by the yeast and not bad bacteria. Lager yeast strains are quite prone to producing sulfide odors. This is quite normal. If you properly condition your bottled beer (the lagering process) by letting in stand for a few weeks, the smell should go away before it's time to drink. Let your beer sit and be patient about it! I didn't tell you the whole story above. I was a very novice home brewer and I decided to bottle the batch any way. I left them for a fair time and then cracked one open. Did you ever make a volcano for a school experiment when you add baking soda to vinegar? You get an explosion of foam and that's what happened to my beer. This was most likely caused by the unwanted bacteria continuing to work its own fermenting magic on the malt in the beer. What a waste of time, energy and money! So to prevent the smell of rotten eggs, you have to stop the infection from occurring in the first place. You must ensure that you have clean equipment and that you've done your best to sanitize it, and kept it clean during the beer brewing process. Why does my beer taste like chlorine? Or more rather, are you asking why your beer tastes like plastic or iodine? If you used chlorine to sanitize your brewing equipment, you may have over done things, especially if you didn't rinse properly afterward (which is why we recommend using sodium percarbonate instead of bleach products). You may also have a water supply that is overly chlorinated. If you used this to rinse equipment of brew with, that's most likely the cause. The simple solution is to not use such water, however it may be that kind of water is your only source. What can do then is either filter it or boil it for 15 minutes, leave to cool (we don't want you burning yourself or killing the yeast!) and then using it. If you do need to use a chlorine bleach, then use no more than half an our per gallon of water and rinse with said filtered or boiled water. Why does my beer taste like grass? You could be forgiven for thinking we are just naming every kind of flavour there can be and say that it can be found in beer. So forgive us when we say that beer can taste like grass. This can be caused by using old ingredients like malt and grains that have been exposed to moisture. The best way to prevent this grass flavour is to use fresh ingredients and to store them in dry but dark places. Or it could be that if you've used fresh hops, you've added too much leaf and stem material. It should be obvious what to do. Grass taste should not be confused with some of the qualities that certain hops impart into beer. Cascade hops are often commented on by brewers as having this affect. What could be the case here is that the beer has been hopped too long. It depends on what you are going for off course but a lot of home brewers dry hop shortly before bottling to try and capture as much hop flavour as they can. A beer that has aged for a longer time with hops may lose some of its zesty-ness and be construed as being more grassy than hops. It possibly depends on how bitter the hops are as well. Why does my beer taste like cider? This one is a classic result. One of the reasons home brewing in the 'bad old days' was because beer tasted too sugary sweet like cider. And what was the cause of this? If you make your beer with too much corn or cane sugar, cider like flavours will develop. Brewers looking to increase the ABV of their beer will often add extra fermentables (extra as in more than the beer recipe required). Sugar is cheap and fermentable so they will add an extra kilo or pound of it and get the cider result as a bi-product. What you can do is off course reduce the sugar and supplement with other fermentables like honey or more malt extract (DME) - basically use more beer enhancer! Help! My beer has nice fruity smells! Brewers often report that their beer smells like fruit - banana, strawberry, pear and even raspberry. This fruity smell is quite likely to be an ester called isoamyl acetate. The occurrence of it in beer is extremely common. Like many of the flavours and smells in this guide, they are a by-product of fermentation where the temperature was too high for the yeast, or there was too little yeast pitched. Generally speaking, the higher the temperature of the beer, the more ester that is produced during fermentation. They are caused by acids in the wort combining with alcohol. The concentration level of ester will also depend on the kind of beer that is being made. German style wheat beers and Belgian ales tend to possess theses as a deliberate beer aesthetic. Go Bavaria! One way to reduce the production of esters in your beer is to use a tall and narrow fermenter than shallower vessels. According to the American Homebrewers Association "this is because high hydrostatic pressure and levels of CO2 in the tall, narrow vessels inhibit ester formation." We did say beer was a science! To remove your unwanted esters the solution you have to prevent them from occurring in the first place so try and brew your beer at the recommended temperature for your yeast, favoring the colder side of the spectrum. This is especially so if you are brewing a lager because esters to nod add to the drinking experience of a lager. The other option is to over pitch your yeast to ensure that there is no deficiency >> a low amount of yeast tends to make the yeast work harder and produce more esters. Finally, ensuring your wort is properly oxygenated prior to primary fermentation will help the yeast function as intended. A final amusing point on isoamyl acetate is that it is actually used as an artificial flavoring for things like banana milkshakes! Now I've never drank paint thinner but I've sure smelled them ! They are strong and pungent. 'Paint thinner' is a term for solvents that are used to thin oil based paint or for cleaning up paint brushes and maintaining equipment like chainsaws. They are usually referred to as white spirits , turpentine or acetone. Either way, you recognize them as smelling quite harsh - and you can imagine the taste. While most people do not drink solvents, many brewers often report that their beer has a 'paint thinner' taste. What is most likely the cause of this flavor are fusel alcohols. They are sometimes referred to as fusel oils. 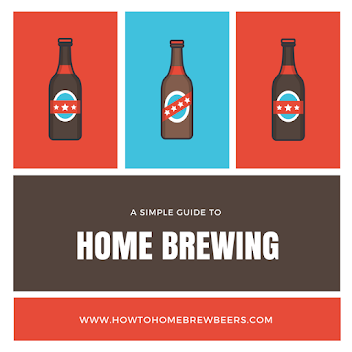 These occur naturally in home brewing and will occur at noticeable levels to the palate when the beer is fermented at too high a temperature of the beer is left in contact with the trub for too long. The way to prevent fusel alcohols occurring in your beer is to ferment at the recommended temperature for the beer you are making. Most certainly do not leave your beer to ferment for a week in a closed shed at the height of summer! It will surely be too hot. Ensuring you use a correct amount of yeast can help. 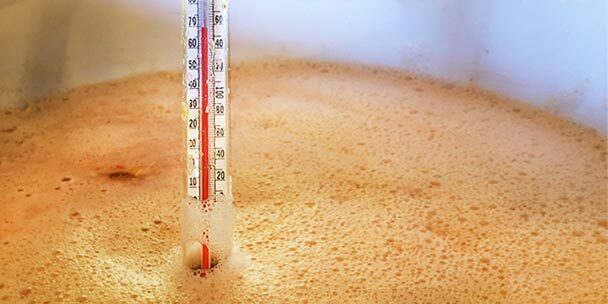 If you have difficulty controlling the temperature of your brewing situation you could try using yeasts known for their ability to handle higher temperatures, such as Belgian yeasts. Letting the bottle beer condition for a good length of time will also give the fusels a chance to break down. Tart tastes can be caused by polyphenols which are caused by over milled grains that are steeped too long. Butterscotch or buttery flavors can be diacetyl and is naturally occuring. Affected by temperature and over oxygenation post pitching of the yeast. Cough Syrup - possibly phenol which can be caused by a variety of things including improper sparging and mashing techniques, temperature ranges, and sanitizers and cleaning products that utilize iodine or chlorine. Metal, pennies - a contaminant from nonstainless metal kettles and poor water. Salt - you probably added salt to your beer. WTF? Soap - you probably added soap to your beer (again WTF) or you left it to soak too long in the primary fermenter and your beer is literally turning into a form of soap. No, you can't shower with it. If you've made it this far, you will appreciate there are many factors and processes which can contribute to off flavors in your home brew (and of course ciders and wine). We haven't even covered them all! Some of them occur naturally and will fade away as part of the normal practice of brewing is followed. Others will be fatal to you beer (such as a bacteria infected or skunked beer). Using well-established brewing practices will help alleviate many of these problems from occurring. So yes, clean and santize your equipment, use fresh hops, brew at correct temperatures and let your beer condition properly and you will have a good tasting beer. Why do I need to take the temperature when brewing beer? Which is how the temperature of beer works in determining that beer tastes just right. A beer that is brewed at too high a temperature may produce unwanted fruity flavours (esters) or excessive diacetyl traits. A beer that's too cold won't even brew at all. And that's just no fun, even for Goldilocks. So, if you know that the beer you are making needs a certain kind of temperature, how does a brewer work the temperature out? The classic tool known as a thermometer. But let's cut to the chase. 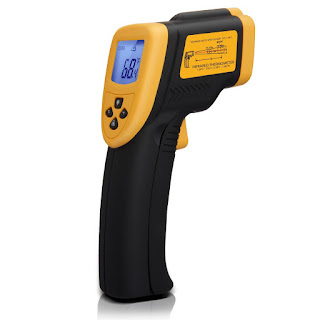 The Etekcity Lasergrip Laser Infrared Thermoeter is the bees knees and well worth a trial. 'Pitching yeast’ is just homebrewer lingo for adding your yeast to the wort. Pitching your yeast is more than simply adding it to your beer – it needs to be done at the correct time in the brew so that it can activate properly and begin fermenting. If you pitch your yeast when your brew is too hot (say you’ve just boiled it), you will kill the yeast with the heat and fermentation will not occur. Hence, brewers should use a thermometer to ensure the correct pitching temperature has been achieved. Many home brewers will be quite familiar with the standard floating glass thermometer that seems to be supplied with some many beer kits (historically at least). These glass thermometers generally are designed to measure a temperature range of 0-100 Centigrade (32-212 Farenheit). A great benefit of using them is that it is there use is so simple - it can be simply dropped in your pot or mash tun. It will of course float and be able to be read when ever you like. Being glass, they are of course susceptible to breakage more easier than some of the heavy duty temperature measuring devices. Check out some handy examples you can order on Amazon. Generally speaking, it's good practice to store your beer in a warm place. This will encourage secondary fermentation (this is sometimes described as bottle conditioning). HOWEVER after that period, you should leave them in a much cooler place with a temperature range between approx 8 - 12°C. Three weeks a good length of time at that temperature range before you crack open a bottle. A step up from a floating unit, a bi-metal dial thermometer is a more robust measuring device which will give you a quick reading when checking the temp of the mash tun. They are some times called kettle thermometers. These dial thermometers are also fairly easy to calibrate and they need to be as they can become inaccurate easily, especially when brewers use them frequently regularly. Dropping them once or twice certainly does not help so their calibration should be checked often. The use of the bi-metal thermomter is pretty simple - the have a clip which fastens to the tun or kettle. The 9 inch probe they have extends into the wort to take the measurement. 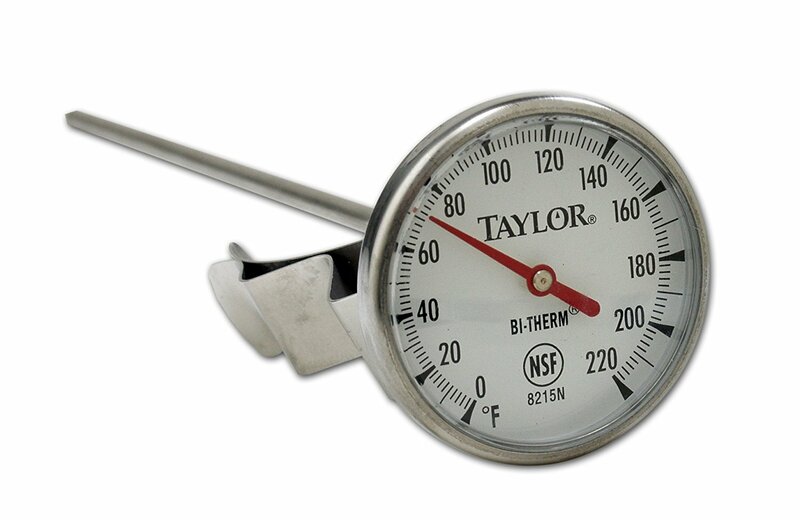 A good quality dial thermometer will be welded with a stainless steel housing and corrosion resistant to most chemicals. Like this Tel-Tru 42100909 Model from Amazon! This is why the cooling process can be so important. When cold crashing beer you want the beer to be really cold so the yeast becomes flocculent and falls to the bottom of the beer. You don't want to freeze your beer but you want it pretty cold so using a thermometer to measure the coldness of your fridge or unit you are doing the crashing in is pretty smart. The common recommended range varies from 33 degrees Fahrenheit to 40 degrees F, with 38 degrees F being a fairly popular temperature point. 40 F is about 4.4. Centigrade. Just remember a 5% ABV beer can start to freeze at 28F. An infrared thermometer is the bees knees in regards taking the temperature of your brew. You do not dip the unit in the beer wort you use project a laser at an object (such as beer) and the device then measures the temperature based on the infrared reflection. So basically to use it you just point and shoot it at the surface of the water and it will give you the surface temperature reading. One reviewer on Amazon said "I found it to be quick and accurate for measuring water, the temperature of the pot itself, and external temperatures of fermenters." Pew ! Pew ! Pew! Target quicker: a built in laser gives you the precision to hone in on the exact space you want to measure. We say the real benefit of using this device is that you don't need to get even close to hot water or wort - you can keep your distance. I've seen it reported by brewers that when working with an all grain mash tun infrared devices can have some trouble. The foaming and grain on top of the mash tun can interfered with the laser which can give incorrect readings.